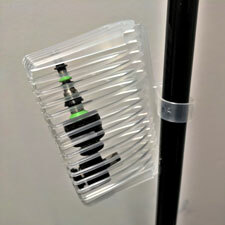 Single use Valve Purse used for safe storage of endoscope valves. Helps ensure reusable parts are processed together and stored with specific endoscope to allow traceability. The Valve Purse locks onto the endoscope and has large openings that allow detergents to flow through easily and effectively.